In retrospect, only one American team memeber did his homework well in advance of this year's Ryder Cup. Notably, dude was Team USA's most successful competitor on the weekend, going 4-1 in his matches. The correlation is no surprise. The Albatros course at France's Le Golf National club is one that demands a player's full attention. Or else you're gonna get your patootie pounded by those who know it. Above all else, that was the prime takeaway as Team Europe reclaimed the Ryder Cup with a convincing 17½-10½ demoliton of Team USA that was so complete, it'll only be a matter of time before American finger-pointing comes outta the shadows. The Americans came into today's singles matches knowing that looking to overcome a four-point deficit that accrued from their collective shortcomings in the team pairings of Day 1 and Day 2. Most of them can be laid at the feet of incredibly poor course strategies. Albatros, with its narrow fairways, tough rough, and imposing water hazards, is not built for bombers like Dustin Johnson and Brooks Koepka. Dudes didn't adjust and got crushed. Fittingly and predictably, the point that put Europe over the top came from British Open champ Francesco Molinari. The Italian's 5-0 record this weekend puts him in stratospheric company. Dude's become the first European to sweep all five points available, and joins Arnold Palmer, Gardner Dickinson, and Larry Nelson as the only others to accomplish this feat. Thomas made the trip to play here at the French Open, and it's showed all weekend. Patrick Reed was already chirping about how team captain Jim Furyk used him. Where was that on Friday and Saturday? Most likely all that remained after he joined Johnson and Koepka in believing a scorched earth policy could tame the Albatros. 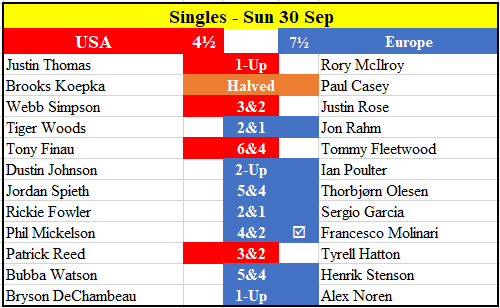 The champions have a new star in Tommy Fleetwood and walk-the-walk sages in Thomas Bjørn's captain's picks Ian Poulter, Henrik Stenson, Paul Casey, and García. That crew out-pointed Furyk's choices of Mickelson, Woods, Bryson DeChambeau, and Tony Finau, 9½-2. Finau had a hand in both of those points. Maybe he could've been utilized more. Absolutely nothing in golf compares to the Ryder Cup in terms of carnival atmosphere and how individual players react to it. When the Europeans are on home turf, they bask in it. The Americans, not so much, if the past two Cups on the continent are any example. Raw nerves were on display in Scotland in 2014. Odds are Reed's snipes are not outliers. More will surely follow. At least it means they care.